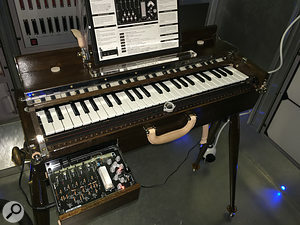 The Ondes Martenot is far from being a new musical invention — the French keyboard instrument with a theremin-like sound was first developed in 1928 — but Japanese company Asaden have been showing off their version for a modern audience at Berlin’s Superbooth. There are two ways of playing the instrument. Firstly, there’s a traditional four-octave keyboard, but additional expression can be applied with a lateral movement for applying vibrato. Like the theremin, one hand is dedicated to pitch while the other is dedicated to amplitude control. The second method of playing the Ondomo (as with all traditional Ondes Martenot) is with the ‘ring’. This is worn on a finger of the right hand and connects to the instrument by a thread, letting the user play but with continuous pitch control. Ideal for those moments where you must play the theme from the original Star Trek with note-perfect accuracy. The places where Asaden have really stepped things up are in the speaker and tone control arenas. The tiroir (control box) lets the user mix between speaker outputs (including a built-in speaker), and select the waveforms used by the inbuilt analogue oscillators. They’ve also managed to make the instrument a lot more compact and portable, with their version — Ondomo — coming in at only 64cm/just over 25-inches wide. Also that it only weights 13lbs/6kg. It will be available for around €2000.